In August of the year 1911, five Sisters of Mercy – Mother Donnelly, Sisters M de Pazzi Walsh, M Cecilia Keys M Camillis Sala and M Bernard – journeyed to Walcha from Gunnedah to commence the teaching of the faith to the Catholic children. They travelled for two days along the rough dusty country roads by horse and buggy, bringing what possessions they could with them to furnish the newly completed convent and school which had been built on the present site. The Sisters had many challenges to meet on their arrival in Walcha. Primitive living conditions and very few possessions were amongst the most difficult. The school equipment was inadequate and the helper teachers were paid when the parish could afford it. Many of the children came to school without shoes and their lunches consisted of bread and dripping sprinkled with salt. School fees in 1911 were six pence a week. The Sisters taught large composite classes at Intermediate level along with the traditional sewing, music, typing and business principals. A local identity who studied this course was Erle (“Blue”) Hogan (pictured below). 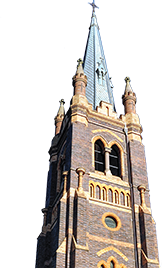 A meeting of parishioners was called in 1975 when it was realised that the Sisters could not continue teaching at Walcha. An interim school board of parents was established in that same year the Catholic community organised a farewell dinner for the Sisters in appreciation of their services, for without their dedication and tenacity in those 64 years St Patrick’s School would not be in existence today. Front row: —-, —-, Athena Andronicus, Joan Hogan (Delaney), Bessie Andronicus, Eileen Hogan, Jean Kelly. The school in 1974 had an enrolment of 54 pupils. Father Bernard Flood was then Director of Catholic Education in the Armidale Diocese. In 1976, Mr Maxwell John McGinty was appointed Principal. He had a staff of two and an enrolment of about 85 pupils. By 1981 this had grown to 130 pupils with six teachers. To accommodate the increasing enrolments the school required new buildings. The first stage of the “Mercy Block” – a memorial to the Sisters of Mercy – was completed in 1977, the second stage in 1981. In 1979, Bishop Kennedy opened the “John McKeon Memorial Library”, the Library (formerly Father McKeon’s “weather shed”) and the first stage of the Mercy Block were built by voluntary parent labour under the leadership of Mr Len Fenning. The Parish arranged a loan of $38,000 from the Diocesan Investment Fund to finance the first stage of the Mercy Block; the second stage and the Library building were funded by the Schools Commission. The School oval at the back of the Presbytery was levelled in 1977 for sporting activities. In 1979 the parish purchased a house in Angle Street to overcome the teacher housing shortage in Walcha. The School crest and motto “Growing in Wisdom and Faith” was selected from the entries received by the School Board in September 1980. Tricia McCormack, Elizabeth Conchrane, Patricia Beattie. Listed are the teachers who have taught at the School since 1976: Max McGinty, Annette Henry, Elizabeth Cochrane, Kerry Walker, Judy Burke, Elizabeth Preston, Nona Pyrke, Joanne Seery, Joanne Ormorod, Tricia McCormack, Patricia Beattie, Silvana Nero, Kevin Humphries. Ancillary staff: Sue Fitzgerald, Rhonda McGinty, Sue White.